Tomorrow being Thanksgiving Day, I would like to share this thought. I hope you enjoy it. First among the things to be thankful for is a thankful spirit. Some people would grumble at the accommodations in Heaven if they ever got there. They take their blessings here so much as a matter of course, that even a day of general thanksgiving once in a year is more than they feel any need of. And if their personal blessings in any measure fail, gratitude for what they have had or still enjoy is the last thing they think of. Another class really desire to be thankful, but they are naturally despondent. Their sky is as dark with clouds as though a special “Old Probabilities” were employed to keep it full. They go through the world in a deprecating spirit, hoping things may turn out well yet fearing for the worst. We always feel glad for this class when Thanksgiving Day comes around. They then have an official warrant for gratitude, If their own hearts do not formulate blessings, they can listen to the sermon, or look to the President’s proclamation. How different with the thankful heart! What a gift it is to be born with an outlook toward the bright side of things! And if not so by nature, what a triumph of grace to be made thankful through a renewed heart! It is so much more comfortable and rational to see what we have to be thankful for and to rejoice accordingly, than to have our vision forever filled with our lacks and our needs. Happy are they who possess this gift? Blessings may fail and fortunes vary, but the thankful heart remains. The Happy past, at least, is secure–and Heaven is ahead. Steeped in glory and tradition, Object of acclaim. I’m singing your praises Pennsylvania. What needed to be done, has been. Commonwealth Court Judge Robert Simpson has blocked implementation of the Voter Photo ID Law until after the election. Now, while the move by the court only delays this law until after this years election, we will now see if there was ever any reason beyond preventing President Obama’s reelection for this law to be in place. We will see if voter fraud was a problem or if this was, simply, a fraudulent attempt to suppress votes. My guess is [it was] the later. Since the 1960’s, there has not been a more blatant attack on America’s civil rights, indeed, an attack of the most basic right of our society, the right to vote. This is not just about Pennsylvania, though. Their’s was the most restrictive of many such laws passed in more than 30 states over the last few years. Some have been struck down by the Voting Rights Act (that’s come under fire lately), and others by Local and State courts that have determined that the laws were an unnecessary intrusion on our voter franchise. My guess is, though, this is not just a one shot deal. Most of this talk about in-person voter ID fraud will quietly dissipate, but it won’t disappear. Voter suppression and manipulation is as important down-ticket, at the State and Local level, as it is nationally. What this process has shown us is that State Houses, State Legislatures, and locally elected Judges play as much a part in this scenario as the National ticket. We must be aware, and beware. The war continues. It is in the local courts where laws are being upheld that are restricting or eliminating more of our basic freedoms. Like freedom of choice for women, freedom to choose who to marry, freedom to bargain collectively. Even the right to be governed by our lawfully elected officials is being challenged. State Legislatures are realigning voting districts to dilute the power of constituency voting. So, congratulations Pennsylvania. A battle won, but the war goes on. The Detroit Metropolitan Bar Association’s Judicial Candidate Evaluation Committee has completed it’s ratings of judicial candidates for the Wayne County 2012 election cycle. Of the candidates for 36th District Court judge, Doug Monds has been rated “OUTSTANDING,” the highest rating available from the committee. 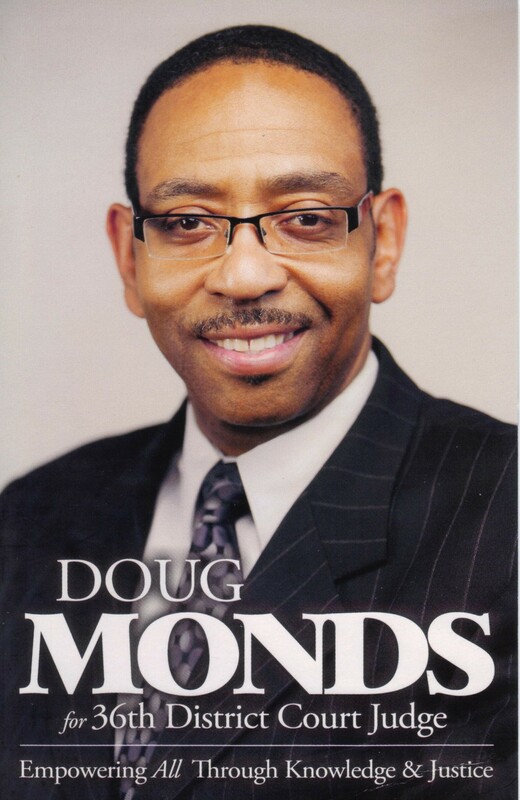 The 36th District Court needs Doug Monds. The City of Detroit needs Doug Monds. 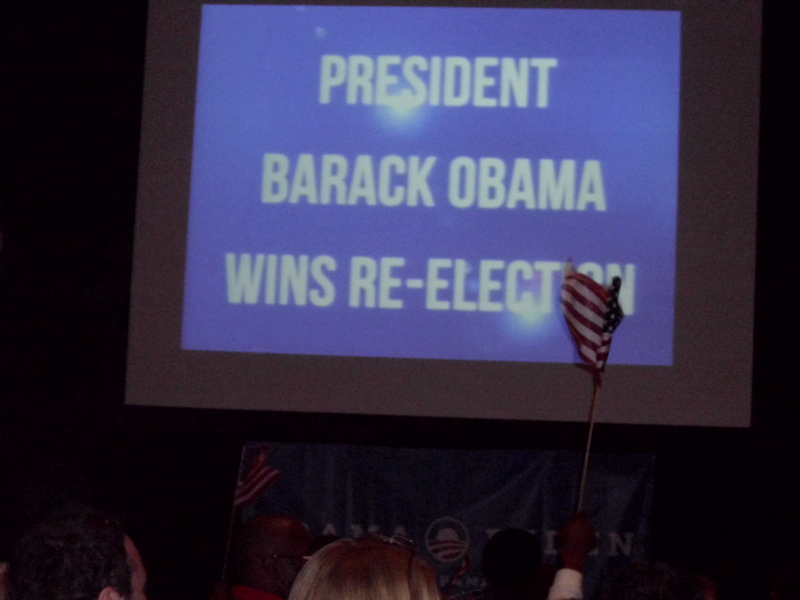 Be sure to vote in the primary election August 7, 2012. Be sure to vote for Doug Monds! With all the attention on the national election, and believe me that attention is warranted, we are drawn away, sometimes, from the very important, and perhaps as critical political races, being run in our own backyards. Such a race is the one for 36th district court judge here in Detroit. Detroit needs and deserves someone on the court who sincerely wants to make a difference for the city and it’s citizens. That person is Attorney and Administrative Law Judge, Doug Monds. Recently I sat and talked with Doug and was impressed both with his qualifications for election and the vision that he has for the city he loves and wants to serve. I want to share with you some of what I learned from our conversation. His story began in Detroit, just over 50 years ago: “My father was a hard working entrepreneur, having started his own trucking company. My mom, a registered nurse. Me, my sister and my brothers went to a small Lutheran School on Tireman and Burnett,” on Detroit’s west side. “My Education started in that four room school house,” Doug continued, “and progressed to St. Mary’s of Redford High School, Morehouse College in Atlanta – famously known as the school of Reverend Dr. M.L. King and then the University of Michigan Law School – the number three law school in the entire country.” After graduating from law school Doug landed a position as an Associate Attorney at Miller, Canfield, Paddock and Stone, one of Detroit, and Michigan’s, most prestigious law firms. “I eventually left the firm in my quest to gain more trial experience,” said Doug. Doug Monds is a winner. He deserves your support. The primary election for the 36th District Court is Tuesday, August 7, 2012. Be sure to get to the polls and vote. Be sure to select Doug Monds.